The Model 261 with gold door is a non-catalytic woodstove that can be rear vented straight out. This stove is a problem solver for those needing to replace an old stove rear vented into a chimney thimble hole low to the floor. The 2.5 cubic foot firebox holds up to 21" wood. Mobile home approved. Rated by Buck to heat up to 1800 square ft. (We feel their rating is understated for our climate and that it can easily heat several hundred more square feet.) Includes Queen Anne legs and moveable collar (rear or top). 78.9% efficiency! The gold door does not need constanst polishing as does solid brass. Hurry, only 1 left at this price! 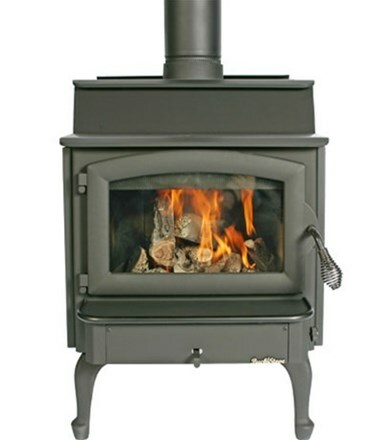 A rear vented, heavy-duty boiler plate steel stove is as about as rare as hen's teeth in today's marketplace.